It’s getting cold, and that means it’s a lot harder to wake up in the mornings. We consider it a public service to be able to offer a breakfast option that will make your family want to get out of bed. Enter the Dutch Baby, a giant pancake or popover that comes to us care of the German immigrants that came to North America centuries ago. 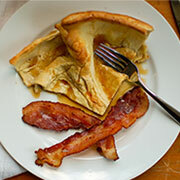 You might have heard of it before without knowing it—a Dutch Baby also goes by German pancake, Bismarck, or Dutch Puff. It’s absolutely delicious—lightly sweet, lightly eggy, and it forms with a dome that crawls up the sides that just begs to be filled. Traditionally, a Dutch Baby is splashed with vanilla and cinnamon, but you can load it up with whatever your favorite toppings are. Butter, sugar, and lemon are a great combination. Maple syrup or honey are both delicious. And if you’re going with a fruit, stewed fruits or pie fillings are a better call than jams and jellies. If you can barely function before you’ve had your coffee, no worries. Dutch Babies are one of the perfect foods to be serving on those “breakfast for dinner” treat nights. The scent of the cooking popover fills the whole house, and by the time it’s ready everyone’s mouths are watering. Instead of calling around the house, you’ll be beating everyone off with a stick. Serve with a side of bacon to cut the lightly sweet batter with a salty, fatty crunch. Dutch Babies are fairly straight-forward, and will make you glad you had cast-iron in the house. Preheat your over to 425 degrees. In a Preseasoned Cast Iron 10 Inch Skillet, melt 2 tablespoons butter over medium heat and set aside. 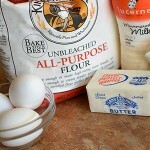 In a blender, combine eggs, milk, flour, salt, vanilla, and ¼ cup sugar. Blend until foamy, about 1 minute. 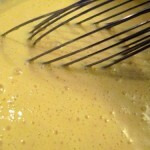 Pour the batter into the skillet and bake until the Dutch Baby is puffed and lightly browned, about 20 minutes. Top the Dutch Baby with your favorite toppings. Butter, cinnamon, and powdered sugar are classics, but you’ve got to use what you like most! This recipe presumably serves four, but that really depends on if you want to share. Have you tried this recipe yet? Let us know what you think of it! The jury’s still out on which toppings are the best—but that’s because the judging process is too much fun. If you’ve settled on a favorite, leave it in the comments! Apples, or lemons, or a citrus coated apple with a little cinnamon. The citrus will keep the apple fresh looking until it is baked, and keep it from getting too sweet. I can’t wait to try this! Great idea, Shelley! I’ve seen a few other comments floating around with either apple or lemon, but if you use them both in the right amounts you get a toping that tastes as good as it looks. Thanks for contributing! happen to be a great author.I will always bookmark your blog and will eventually come back at some point.